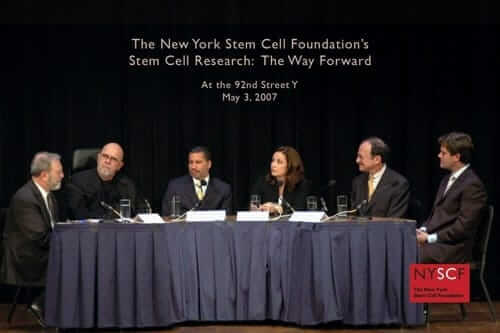 The New York Stem Cell Foundation and the 92nd Street Y presented a panel discussion entitled: Stem Cell Research: The Way Forward. Joining NYSCF CEO Susan Solomon for the panel discussion were: Chuck Close, renowned artist and patient advocate; Harold Varmus, MD, President and CEO of Memorial Sloan-Kettering Cancer Center, and recipient of a Nobel Prize; the Honorable David A. Paterson, Lieutenant Governor of the State of New York; and Kevin Eggan, PhD, Assistant Professor of Molecular and Cellular Biology at Harvard University and a 2006 MacArthur Fellow. Leonard Lopate, host of the daily Leonard Lopate Show on WNYC radio, served as moderator.